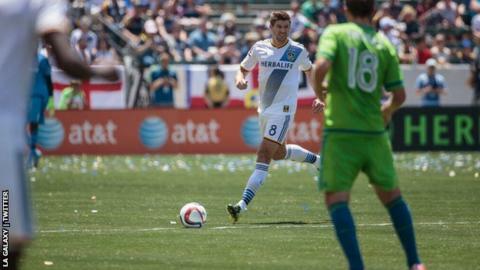 Robbie Keane scored and set up another for LA Galaxy in a 3-1 win over Seattle Sounders in Major League Soccer. Keane slid in to score in the second half, and put in ex-Tottenham team-mate Giovani dos Santos for the third. Sounders took the lead within the first minute as Chad Barrett netted from close in. He then injured his hamstring while celebrating and had to go off. Galaxy levelled soon after through Gyasi Zardes's clipped finish from Juninho's cross to the back post. Former Liverpool man Steven Gerrard had a quiet game but had an opportunity to get on the scoresheet, running on to a through ball into the box. However, a poor strike saw the ball dribble into the hands of goalkeeper Stefan Frei. His best moment came in the first half as he set up former Liverpool team-mate Keane with a neat back heel, who struck a shot over the bar.